We put in under cottonwoods at Deerlodge Park, in Colorado, just upstream of where the Yampa, after miles of flowing slowly over floodplain, begins to bite into its canyon and gain speed. Swallows hunted low over the water. They skimmed everywhere, veering this way and that in pursuit of insects too small for me to see. I finished packing my dry sack, rolled the top loosely, and pushed downward to force out the air. Watching the swallows, I leaned my weight on the sack until it stopped hissing, then rolled the top tight and buckled the strap. Swallows, executing these sudden sheer sharp-winged turns, pull what, fifteen Gs? Twenty? If a fighter plane attempted acrobatics like this, the wings would come off. The aircraft would auger in with a splash. The five yellow rafts were lined up side-by-side, noses into the bank, while the heavy stuff was being loaded. The Yampa’s surface caught all available early morning light. The river was the most luminous thing in the landscape. The swallows raced their reflections across the faint upwellings and gentle eddies and mirrored clouds of this slow stretch of water. I tried hard to remember this spot. We were at river mile 46.5, more or less. Sixty-two years had passed since I had last run the Yampa River. I could not remember at all. In 1952, when I was eight and my brother Bob was six, my father took us down the Yampa and Green Rivers with a party of Sierra Club rafters. Earlier that year, my old man, David Brower, had become the first executive director of the Club, and this was his first big battleground. We were all fodder. He loved us, Bob and me, and he was solicitous of his Sierra Clubbers, but right now we were chess pieces in his campaign to kill a pair of proposed dams on the Green. 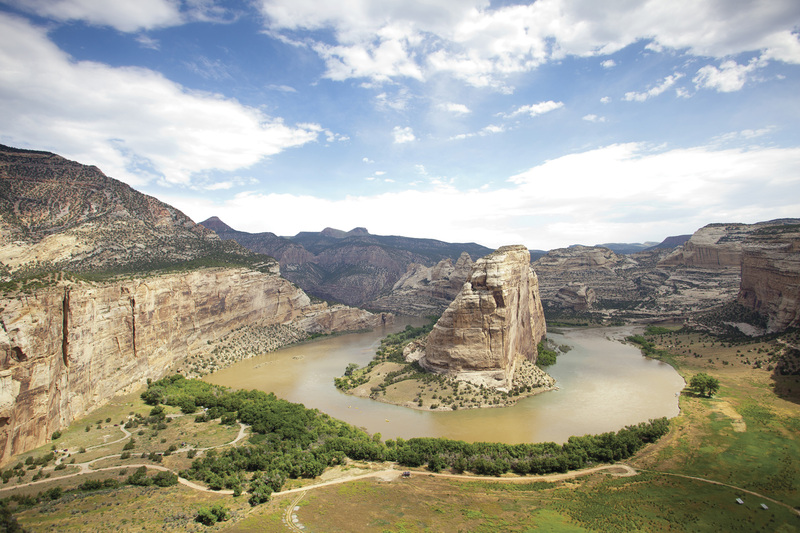 The dams—a big one at Echo Park and a smaller one at Split Mountain—would have flooded the canyons of the Green and its tributary, Yampa, inundating the heart of Dinosaur National Monument. My father and his faction won. It was the first time in American history that a group of citizens stopped a big government project. He orchestrated what was in many ways the prototypic preservationist campaign: a book, magazine articles, a film, a traveling slideshow, grassroots organizing, river trips, lobbying out West and back in Washington. The victory brought the Sierra Club and my father into national prominence and it served as a template for his successful fight, a decade later, against two dams proposed for Grand Canyon. Various moments of inception have been proposed for the environmental movement—the first Earth Day, in 1970, for example, or the publication of Silent Spring in 1962—but these two are a bit late. A number of historians argue that the movement dawned earlier, with the defeat of the dams in Dinosaur in the mid-1950s. Last June, six decades downstream of the dawn of environmentalism, our little yellow OARS fleet shoved off and caught the current. Soon the first riffles appeared ahead as the river began the dive into its canyon. At this point, river mile 45.2, give or take, recollections began to come back to me. I remembered the look of these formations, layers exposed by the river as it cuts down into Earth and back through time. 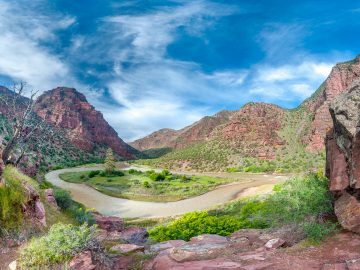 First and uppermost—the rimrock here—was the golden tan of Weber Sandstone, a deep stratum of fossilized dunes from the Permian Period, long before dinosaurs. Next came the narrow, alternating bands of orange and gray of the Morgan Formation, deposits of sandstone, shale, and limestone laid down on seafloors when insects ruled the land. The river was narrower than I remembered. This could simply have been the volume of the present flow, between 7,000 and 8,000 cubic feet per second—no great flood—but more likely it was a matter of perspective. At the age of eight I sat much closer to the water. This river, the whole world, was larger then. I could remember certain people clearly. Children are quick to recognize unusual specimens, and Bus Hatch, who guided and outfitted the Sierra Club trips of the 1950s, was one of those. 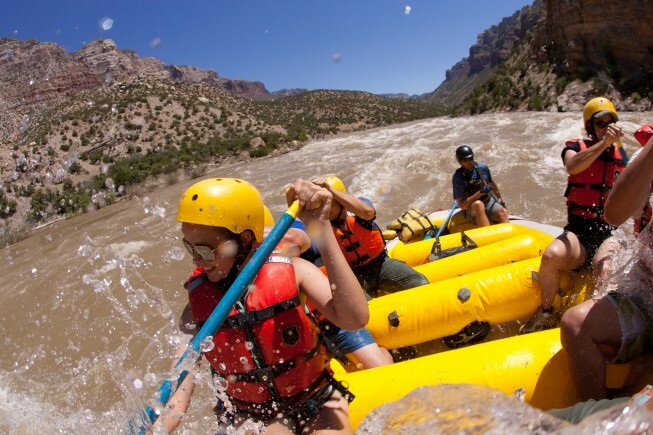 A carpenter from Vernal, Utah, Hatch pioneered river running in the Southwest. He built his first wooden boat in the late 1920s, began learning how to negotiate the local rapids, grew skillful, and eventually launched one of the first commercial rafting companies in the nation. He was an opinionated, sturdy, humorous, stubble-cheeked, sun-brown man who rowed in suspenders, or sometimes overalls, underneath a baseball cap. Even as he guided the Sierra Club through Dinosaur, he guided the opposition, dam engineers doing surveys—their money was as good as anybody’s—but he leaned toward our side. For me, a California boy, Bus Hatch was the first incarnation of the notion “Mormon.” A few miles downriver, eavesdropping, I learned the concept “Jack Mormon,” a lapsed or unobservant member of the faith, prone to salty language and amenable to drink. Here again, I took Bus to be the archetype. I could also remember his son, Don Hatch. 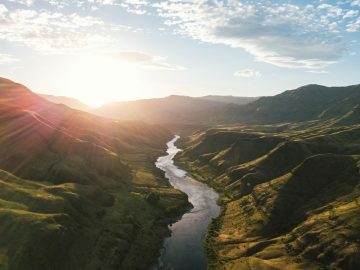 Don leaned harder toward our side—or Don was more willing, anyway, to speak openly, in the little frontier town of Vernal, Utah, of his opposition to dams. He was vilified for it, but he didn’t care. He became an ally of my father’s in the later fight against dams in Grand Canyon. On the death of Bus, Don and his brother Ted divided the family business between them. On the death of Don, his widow Meg ran his half, Don Hatch River Expeditions, for 13 years, then sold to George Wendt of OARS. Part of Wendt’s fleet is still stenciled with the old Hatch brand. 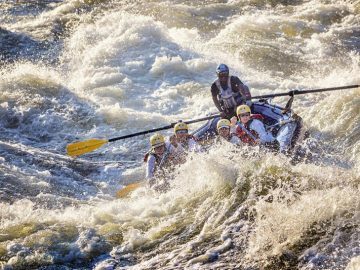 This spring on the Yampa, one OARS boatman suggested to me that the boss’s retention of the name was as much sentiment as it was good business. I could understand. 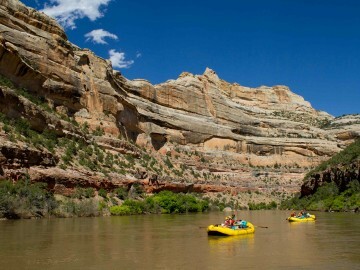 It was very moving to me, in this new millennium, to be floating the Yampa again with Hatch. We reached the mouth of the Yampa mile 0, and we flowed with it into mile 225 of the Green, where it loses its separate identity. Today I was in the raft of the head boatman, who was a woman, Stephanie Wessel. She was twenty-seven and had been at this work for five years. With an occasional stroke of Stephanie’s oar to correct course, we drifted with the Green in its U-turn around the prow of Steamboat Rock. 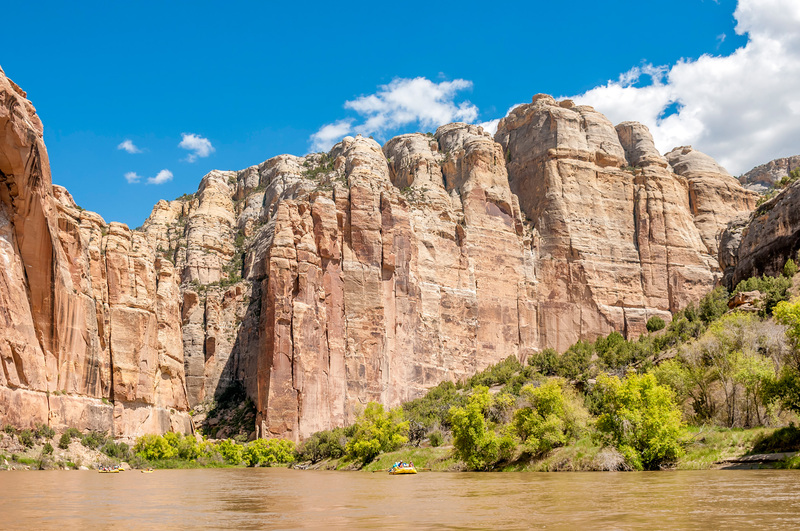 This monolith of pale Weber Sandstone, 700 feet tall, is the icon of Dinosaur National Monument. As we came around to the western side, the rock presented its most dramatic and sculptural aspect—less steamboat now than a sort of a tall, crouching pillar waiting to be carved into a sphinx. In a 1955 propaganda pamphlet, “What is your Stake in Dinosaur,” my father opened with a black-and-white photograph of Steamboat from this angle. At about 350 feet up the face, he superimposed a wavy red line marked “Low water line.” At about 550 feet up, he superimposed another wavy red line, “High water line.” Between the two he noted “Fluctuation zone.” If Echo Park Dam had been built, this middle zone would have been the white bathtub ring we know from fluctuating reservoirs like Lakes Powell and Mead. Above the red line of high water, nothing remained of Steamboat Rock but a nubbin maybe 100 feet tall. I must have studied his pamphlet hard, as a boy, for now those red lines superimposed themselves again on the pale sandstone of the real Steamboat Rock. At mile 222.6 of the Green, we passed the violently upwarped layers of Mitten Fault and dropped down immediately into Whirlpool Canyon. The walls of Whirlpool are the dark maroon, desert-varnished rock of the Uinta Formation, a billion years old, the oldest exposed rock in Dinosaur National Monument. Uinta quartzite is hard rock that tends to form steep cliffs and narrow canyons, ideal conditions for a dam. At mile 221.8, or thereabouts, as the canyon tightened, Stephanie pointed to a small round cave in the right wall. The opening spilled a little alluvial fan of tailings down the cliff. This, she said, had been a test hole drilled for the dam. We hauled out for lunch just below the dam site, on a narrow beach in the shadow of sheer wall. As I stood in line to make my sandwich, I stared at the small black hole and its fan of reddish tailings. I felt a tremendous surge of pride in my father. “You go, old guy!” I thought. It’s true, one person really can make a difference. This small hole was the only trace of what was to have been a dam 529 feet high. The billion-year-old rock of these canyon walls, with any luck, would go inviolate for another billion. My father ignored his brain trust. Flying back to Washington, he testified that the Bureau’s engineers were inflating the evaporation numbers for alternative sites. The committee chair, Congressman Wayne Aspinall, a dam proponent, was indignant. “And you are a layman and you are making that charge against the engineers of the Bureau of Reclamation?” he demanded. “I am a man who has gone through ninth grade and learned his arithmetic,” my father answered. In a series of blackboard duels over a weekend with Bureau engineers, he whipped them all. A Salt Lake City newspaper awarded the Bureau “the Rubber Slide Rule” for their creative use of numbers. The infallibility of government engineers, a common and dangerous assumption of the 1950s, was in this instance broken. At about mile 207 we entered Split Mountain Canyon, which holds a series of the biggest rapids on this part of the Green. In ’52, when I was eight, “Split Mountain” had an ominous sound. Rumor of these rapids had caused me the most apprehension in advance. I have run many rivers since, and yet, I discovered to my surprise, the dark feeling evoked by “Split Mountain” had not, in sixty years, entirely dissipated. Now, as then, we made it through Moonshine, S.O.B., Schoolboy, and the other rapids of Split Mountain with nothing but happy yells and nobody flipping. Only at the bottom did I realize that I had not once thought of Split Mountain Dam, which was to have flooded this canyon. I had passed the proposed dam site without a bit of rumination on it. I had not thought once of my father. I had ridden the rapids of Split Mountain in the very best way, which is in the present moment. 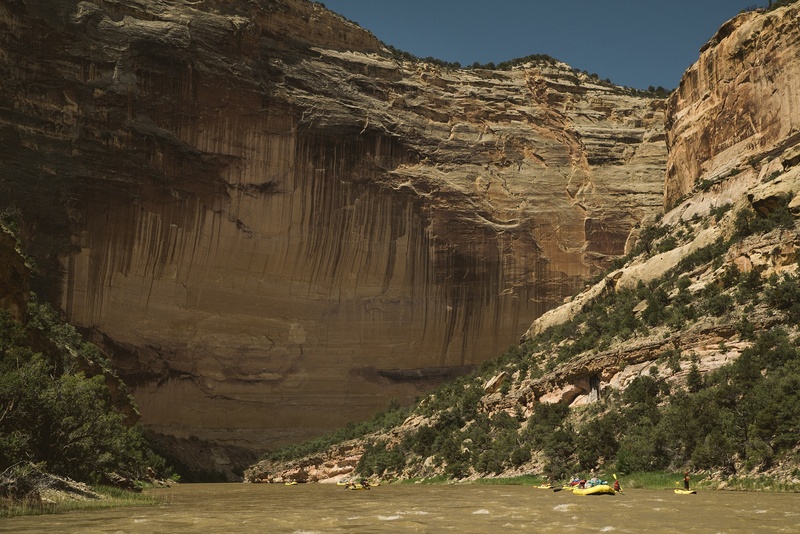 62 Years, a new film by OARS and filmmaker Logan Bockrath follows Ken Brower down the Yampa and Green Rivers as he reflects on his father’s work, their 1952 river trip and how we will confront the looming water crisis in the American West. You can see the film on tour with the Wild & Scenic Film Festival or online at 62yearsfilm.com beginning Tuesday, January 19. Kenneth Brower is the oldest son of the pioneering environmentalist David Brower. Ken’s earliest memories are of the wild country of the American West. He writes on environment and natural history for The Atlantic, Audubon, National Geographic, Smithsonian, and other magazines.